MYRTLE BEACH — Dobyns-Bennett High School’s robotics team, Cyber Tribe 4020, won first place in a regional competition in South Carolina and thus a slot in a national competition in Texas come April. One of two other alliance teams with Cyber Tribe was from David Crockett High School in neighboring Washington County. This marks the first time in seven attempts Cyber Tribe has won a regional competition in FIRST Robotics. D-B also earned the Autonomous Award sponsored by Ford. The team’s website is dbcybertribe.com/, and the FIRST (For Inspiration and Recognition of Science and Technology) website is firstinspires.org/. Inventor Dean Kamen founded FIRST in 1989. The team’s performance at the Palmetto Regional competition in Myrtle Beach on Saturday qualified it for a slot at a national competition that will be held in Houston in April. The team won every round, including its first one. However, before that the team will participate in another regional competition in Knoxville, the Smoky Mountains FIRST Regional on March 29-30. The website for that is tnfirst.org/?event=smoky-mountains-first-regional-challenge. Cyber Tribe ranked No. 1 out of 64 teams at the end of 96 matches at Myrtle Beach. Cyber Tribe team 4020, Rat Rod Robotics team 5022 from David Crockett High School in Jonesborough and Robotz Garage team 4451 of a Laurens, South Carolina, high school were part of a three-team alliance at the weekend competition. D-B teacher Angela Conrad coaches the team. David Hrivnak, a volunteer mentor for the team, said on Monday that FIRST Robotics is an innovative way to get high school students excited about science, technology, engineering and math — STEM. CyberTribe needs to raise funds for the World Championship being held in Houston in April, Hrivnak said. The Knoxville trip already is planned and funded. A challenge is revealed in early January, and then high school teams have six weeks to design build, and program a robot to meet the challenge. 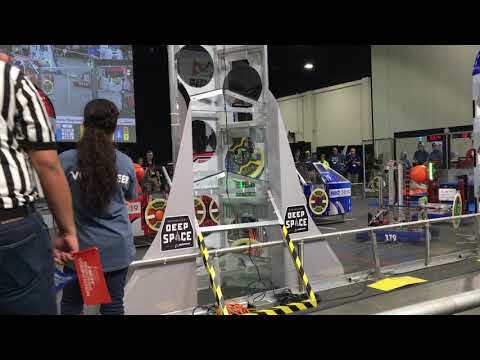 This year’s challenge had a space theme in which teams of three robots have 2.5 minutes to place up to 22 hatches (16-inch disks worth 2 points) on a cargo ship and rockets standing more than eight feet tall. After hatches are affixed, the team loads up to 22 pieces of cargo (balls 13 inches in diameter and worth 3 points). At the end of the match, the goal is to get back to your base (3 points) and, if possible, climb up the 19-inch step of the platform for an additional 12 points. “For fun,” Hrivnak said, for the first 15 seconds a curtain is dropped so the drivers can’t see and have to rely on cameras or autonomous programming to gain a few additional points. He said Cyber Tribe is fortunate to have a practice field at STREAMWORKS that is open to other area teams as well. The students helped in the construction of the practice field. The tournament began with nine qualification matches where teams are randomly formed to compete. During each match, they are paired with different teams. D-B’s team quickly gained first-place rankings and remained there through the qualification rounds. The top eight teams from the qualification matches then picked partners to form an alliance to compete in the finals. Being ranked first, D-B got to pick first, selecting the third-ranked Robotz Garage team as a partner and the Rat Rod Robotics team.